Approved to EN137: 2006 Type II, incorporating the stringent Flame Engulfment Test, ProPak is refined to a level of performance demanded by the professional firefighter. Compact positive pressure demand valve featuring servoassisted, tilting diaphragm mechanism with low inspiratory resistance and responsive dynamic performance, automatic first breath actuation and hands free bypass facility. Sabre-Com is a unique radio communications interface that fully integrates with your existing radio and preferred choice of Scott facemask. Sabre-Com is intrinsically safe and approved to EN136 Class 3. 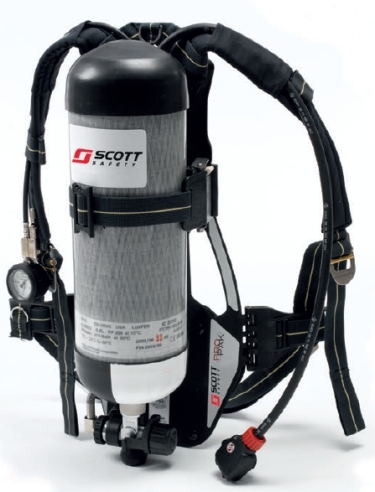 Scott ProPak can be specified in many configurations including Duo, Split Demand Valve Coupling (SDC) and attachments for Airline, which can also be used for Rescue Second Man (RSM) and Decontamination. At the heart of the ProPak set is a simple and reliable two-stage pneumatic system. A first breath activated positive pressure demand valve provides low breathing resistance and excellent dynamic performance - particularly at high flow rates. A first stage pressure reducing valve features only two moving parts and accepts cylinders pressures of up to 300 bar without adjustment.